Wedding Cinematography Audrey and Walter Wedding Trailer Video – Vancouver Wedding Videographer Life Studios Inc. If we were to walk in a wedding dreamland, where James Bond, Bond girl, travelling, regal, action and love exist; then we could totally say we’ve been in that dream and was part of that dream! What can be better than filming one of your closest friends’ weddings? 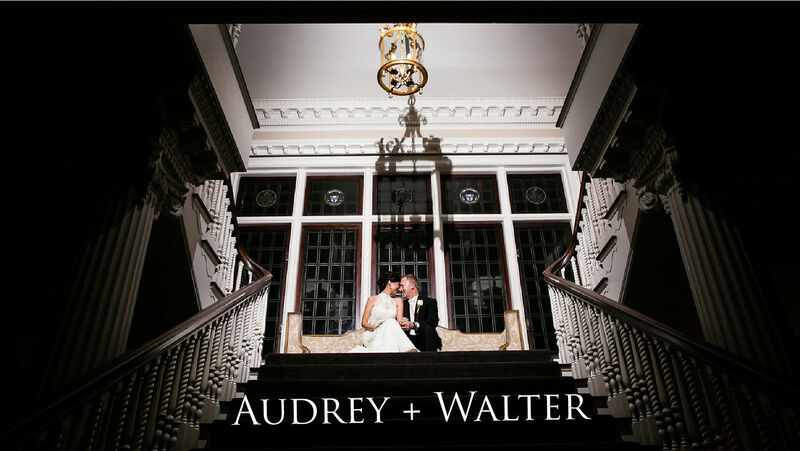 We’ve known Audrey and Walter for years, and we must say that we were quite/somehow responsible for their love story when we introduced them. As we were filming this wedding, we were so relaxed! It felt like as if we were just hanging out and at the same time it was really special. We originally planned a romantic wedding video for these two and last minute they called us, and wanted to do a James Bond Inspired Wedding Cinematography. When we heard the song that they wanted, without a heartbeat we knew that it is the best song for them! Our team was so excited that our shooters came to the wedding dressed like preppy Bond or Bond Boys! The James Bond Theme was set by their ivory, black and champagne passport invitations with the UK Emblem. The ceremony was officiated by, again another good friend of this couple, Rev Allan Burnett. It was such a heart-warming ceremony where tears of joy overflowed. The ceremony and reception were held at the breathtaking Hycroft Manor. It was beautifully decorated with gorgeous flowers and décor, scented with an exclusive aroma and filled with amazing people. Here is the Wedding Cinematography Audrey and Walter Wedding Trailer Video as captured with excitement and shared with so much love. Hold on for the intense ride!